The never ending battle between Star Wars and Star Trek fans continue, but this has not stopped either franchise from milking their fanbase dry with a bunch of new peripherals and products. 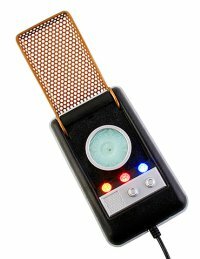 Case in point, the Star Trek USB Communicator Internet Phone that was re-released in time to ride the wave of the Star Trek movie this summer. This VoIP handset will feature USB plug-and-play, making it compatible with most common software including Skype, MSN, AIM, Ichat and others. It also comes with a built-in microphone and earphone, alongside an integrated speaker with 21 sound effects to boot. You might not hitch a ride to space with this, but at least you can pretend you’re talking to someone else on another planet with this $43 peripheral.